St. Alban's has done it again! The 2018 gala and auction set a new fundraising record of $37,000 to benefit Harriet Tubman School in DC, Hope and Resurrection School in South Sudan and St. Saviour's School in Jordan. The theme of the evening, All Kids Bright and Beautiful, was obviously a big draw. All 150 seats at the dinner were sold out a week in advance. 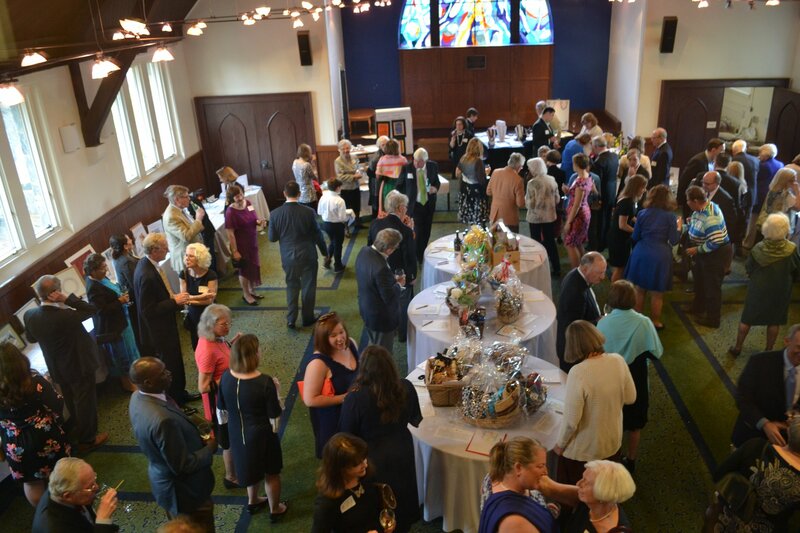 The live and silent auctions alone brought in more than $28,000 as parishioners bid and outbid each other on vacations, hand-made jewelry, gift baskets donated by many of St. Alban's ministries, and much more. Gala organizer Abby Davis got the live auction started by soliciting bids on a most unusual ostrich feather purse. "A great ice-breaker," she said. The Rev'd Jim Quigley's sculpture featuring Torah scrolls on copper was the biggest prize of the evening. Special thanks to auction organizers Dudley Winthrop and Marina Buhler-Miko, and to gala co-chair Mary Garner Devoe, for contributing and gathering so many fantastic items. Many thanks, as well, to Katie Wilson for her help with the catalog. Emily DiBari organized the dinner and transformed Trenbath with decorating help from Margaret Easter and Teddi Wood. Ken Patterson, as always, was an amazing and persuasive auctioneer. And Dennis Gatens and Robyn Carrasquillo once again took charge of the wine sales. "They did a bang up job," Abby said. One new option at the gala this year raised a substantial sum for our beneficiaries: a donor appeal. "It allowed those who had not won anything a chance to show support," Abby said. "We did tiers of $500, $250, $100, and $50 and had a great response from this. People should expect to see it again!"